The antiterrorist operation (ATO) troops returned fire on three occasions. From midnight to 18:00 Kiev time, the ATO troops registered 23 shooting attacks by pro-Russian militants in Donbas. Nine times the militants launched attacks near Avdiyivka. They used heavy machine guns and small arms near Opytne, Vodyane and the Butivka mine. Heavy mortars were used against ATO troops near Luhanske and Nevelske, the ATO HQ said. In the Luhansk sector, the militants shot at Tryokhizbenka and Stanytsya Luhanska once each with grenade launchers and small arms. The Ukrainian armed forces returned fire on three occasions. The secretary of the National Security and Defence Council, Oleksandr Turchynov, paid a visit to the industrial zone of Avdiyivka, which has been the hottest spot in Donbas for a while now. 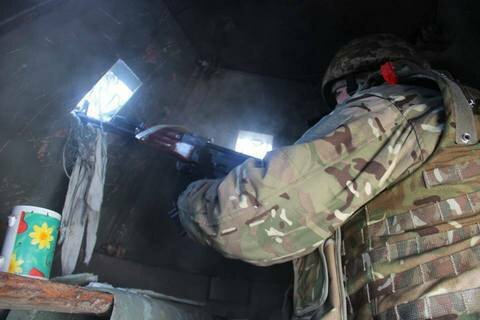 One Ukrainian serviceman was wounded near Avdiyivka on 6 April. ATO HQ reports quieter day but situation "unstable"